Marriage Retreats Can Be the Launch Pad to the Marriage of Your Dreams! Honestly, what couple doesn’t want more out of their marriage? The question we need to ask ourselves is “Am I willing to do what it takes to achieve the marriage of my dreams?” Unattended, relationships will naturally decline. Pursuing a dream marriage requires planning, intentionality, and commitment. Choose to make the new year a time of significant growth in your marriage! To do that, we suggest you and your spouse spend time over the next few weeks to focus on the vision, goals, and dreams you share regarding your marriage relationship. Marriage Retreats are your investment of time and deliberate planning and will be the launch pad for positive development in your marriage! 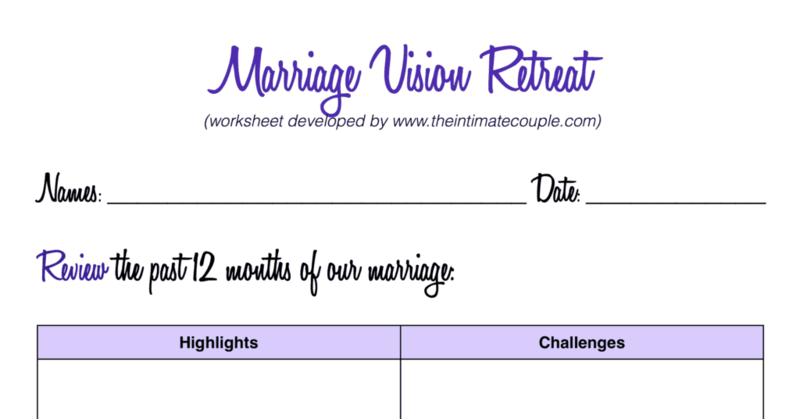 The Intimate Couple team drafted a four-page worksheet for you and your spouse to use during your personal Marriage Vision Retreat. Download the marriage retreat worksheet for FREE!